ExpressVPN is undoubtedly one of the most trusted VPN service providers out there. For this reason, new and existing VPN users still prefer signing up with ExpressVPN because of its reputation of providing quality and stable VPN connections. ExpressVPN has also been one of most consistent winning VPN providers on numerous VPN surveys and awards conducted by (VPN) review websites. Based on the opinions and recommendations of VPN enthusiasts, experts and VPN users, ExpressVPN is rightfully considered as one of the best VPNs today. We all know that accessing foreign contents in China is next to impossible. The ‘Great Firewall’ of China is even consistently blocking VPNs to prevent users from being able to bypass the country’s existing censorship laws and restrictions. China has tough regulations about internet restrictions which is limiting its netizens from accessing popular foreign contents / platforms such as Facebook, YouTube, Google, BBC and Netflix. With such limitations, users in China can only resort to using VPN services that really work. ExpressVPN is one of the few VPN services that can bypass the internet censorships and restrictions being imposed by the People’s Republic of China. This VPN review will highlight the many advantages of using ExpressVPN in accessing foreign contents while in China. ExpressVPN is compatible with the most popular platforms like Windows, Mac OS, Linux, iOS, Android, routers, e-readers, streaming media and gaming console. ExpressVPN also supports different security protocols (PPTP, L2TP/IPSec, SSTP, OpenVPN TCP and UDP) and offers strong 128 bit and 256 bit data encryption. The VPN company also has develop its dedicated apps for iOS and Android devices. People using an iPhone or an Android smartphone can simply skip the manual configuration and setup and just download the VPN app that is available at the app store. To setup ExpressVPN on your device, find the guide and tutorial here. Save 49%! Take 12 months and get +3 months FREE! ( $6.67 / month only ) Click here! If you’re interested in purchasing a subscription from ExpressVPN, be advised that ExpressVPN doesn’t come cheap. Compared to the competition, ExpressVPN offers slightly expensive VPN services. A month of ExpressVPN connections will cost you $12.95 (¥80.35). If you opt to subscribe to a multi-month VPN package, then it would be better since you will get amazing discounts. A six-month ExpressVPN subscription would only cost $59.95 (¥ 371.98). This package is equivalent to paying only $9.99 per month. Now, if you want to save 35%, then choose the annually-billed package amounting to $99.95 (¥620.18). Unlike other popular VPN service providers, ExpressVPN does not offer any trial accounts which is a bit disappointing for those who would want to try the product first before deciding to purchase anything. There is, however, a gracious 30-day moneyback guarantee so if you’re not satisfied with the product, you get your money back with no questions asked. ExpressVPN accepts various payment methods including payments made via major credit cards, PayPal, bitcoin, Webmoney, UnionPay and AliPay, which are China’s leading third-party online payment solutions. If you want to stay truly anonymous, pay with Bitcoin and get your Bitcoins on a anonymous exchange. To subscribe, use a link that works in China https://www.expressvpn.xyz/order. One of ExpressVPN’s main selling points is its large number of servers. As of this writing, ExpressVPN has more than five hundred servers located in 94 countries across the globe. The servers are located in countries like Australia, US, UK, Canada, Philippines, Hong Kong and in other major cities. Unfortunately, there are no ExpressVPN servers that are located in the mainland itself. In order to get a good and stable VPN connection, it is recommended to connect to the nearest server to your location. In which case, Chinese users should connect to either the Hong Kong or Taiwan servers so as to establish fast and reliable connections. These examples of the windows client surface show the ease of using ExpressVPN. But the client doesn’t offer a lot of setting possibilities generally. ExpressVPN is not only a reliable and secure VPN service but it is also acclaimed for its superfast connections. We have tested the connection speeds and quite frankly, we are very pleased with ExpressVPN’s performance. Alongside a stable and fast connection, ExpressVPN also offers unlimited bandwidth. ExpressVPN claims to provide 24/7 customer support. So, we did test the reliability of the live chat support and to our surprise; we got a response in just a couple of seconds. It’s really pretty fast considering how other VPNs take hours (even days) to respond to queries. We asked questions regarding compatibility, servers and purchasing methods, the customer support agent was able to answer all our questions with accurate details. More in this ExpressVPN Review on VPNcomparison.org. 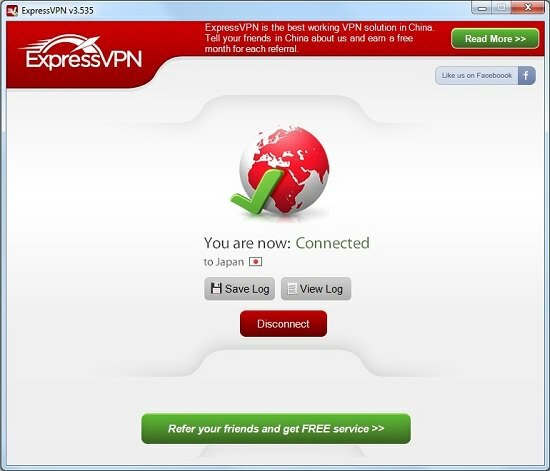 ExpressVPN Review Conclusion: Is ExpressVPN the best tool for unblocking China? Even with the recent crackdown, many Chinese users still find ExpressVPN an extremely reliable VPN service to use in China. Doing the various tests, we are now convinced that ExpressVPN really does work in China and it performs well in bypassing Chinese’ internet restrictions and limitations. For those looking for a reliable VPN service to use in China, we advise you to give ExpressVPN a try. Expressvpn does work for Windows, Linux and Android, but the speed is not so convincing. However, at times when nearly all other vpn failed, Expressvpn still made connection. It worked for a while but now is very very slow and impossible to use. It may not be Expressvpn’s fault but I’ll give it another day or two and then give up and cancel my subscription. Not able to use Hong Kong 3 in Shanghai expressVPN is not much of an asset.